Aussie metal warriors Parkway Drive have been diligently working on their next album -- their third -- for longtime label home Epitaph. You can check out their progress via this exclusive video diary to see what the band was up to. It's four minutes long and contains snippets of the new album throughout, so if you've got a raging case of Attention Deficit Disorder, then this clip is the perfect bite-size for you. 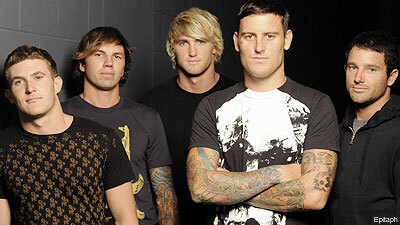 If you're a Parkway Drive die-hard, you're going to be salivating for more. "So after an earthquake, a volcano and about a hundred burritos, we're finished in the studio," vocalist Winston McCall told Noisecreep. "We filmed a lot the whole time we we're in there, but then decided not to give too much away, so the diary gives you a little bit of everything. The sights, the sounds, the smells and a preview into what it was like making album number three. Keep an eye out! This release is going to drop faster than you think, and I highly doubt most of your are prepared for what's in store." The album is currently untitled and the release date is to be determined.